Toys and a scratching post should be introduced early on, as the kitten, growing in confidence and security, will start to look for items to play with, and will want to exercise his claws. In reality, the kitten is developing his skills and reflexes, in preparation for adult hunting sallies. Playing with your cat helps to build up a strong mutual friendship, and it is essential for on-going training success. 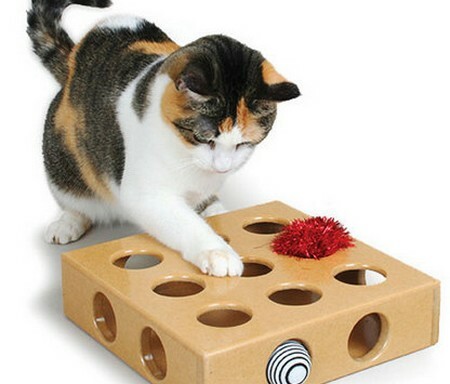 Equipment: Cats and kittens love toys that move or encourage them to chase and catch. Pet stores, garden centres, supermarkets, and trade stands at cat shows stock an amazing array of toys, many garnished with a sprinkling of catnip. These range from ping-pong balls to large aerobic exercise stands and ‘fishing-rod’ type toys with dangling balls, snakes and bird feathers. Home-made toys can be equally effective when playing with your cat. One of the most useful toys we have ever made consisted of a stiff, pastic bag placed inside an old sock. A cat will pounce and ‘kill’ this over and over again. Training Objective: To train your cat to play with the toys you provide, rather than the tassels on your three-piece suite. Start by throwing a ping-pong ball or crumpled sweet paper for your cat. Most cats will respond by chasing the toy along the floor, and sometimes they will instinctively bring it back for you to throw again. Sweet papers that have enclosed mints are most popular. If your cat appears disinterested, try using paper tied to a string, or a similar ‘fishing-rod’ style toy. Draw the end along the floor past the cat, who should then pounce and ‘kill’ the end. Safe toys, such as ping-pong balls, should be available at all times so that the cat always has an alternative to the household furniture.